Regional School Commissioners, capital investment, optimum size and sites for multi-academy trusts (MATs), and issues of governance were all topics discussed at the latest MAT 2020 Forum. Guest chaired by Lord Agnew, School Systems Minister, and hosted by national law firm Stone King LLP, the biannual meetings bring together Chief Executives and managers of leading MATs and other organisations. They share knowledge and experience and step back to consider the big picture for MATs and the wider education sector. 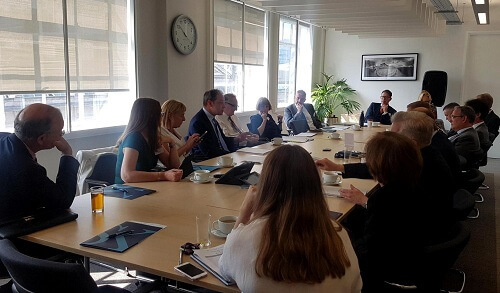 At the latest session, held at Stone King’s Charterhouse Street offices in London, Lord Agnew led discussions keen to take away the opinions and suggestions offered around the table, particularly on how the academy system could be improved. A key subject under discussion was the varying approach of Regional Schools Commissioners (RSCs). The School Systems Minister emphasised the importance of the relationship between academies and RSCs, with attendees advocating a need for greater transparency and consistency between regional decisions. Inevitably the hot topic of capital investment was addressed, including ‘site optimisation’ to ensure that school buildings and land can accommodate the optimum number of students. While exploring the optimum size of a MAT and how it should grow, the Forum agreed that - whether large or small – a MAT’s growth should be at a steady rate with a period of consolidation after taking on new schools to allow time to adjust and take stock. Lord Agnew encouraged discussions between MAT leaders and chairs of governors, both when bringing in new schools and on general governance matters, with acknowledgement of the critical role played by chairs, particularly in their commitment as unpaid volunteers. Each MAT 2020 Forum features a guest speaker to lead discussions on pertinent issues affecting the education sector and MATs in particular. The latest session was attended by representatives of eight MATs as well as the National Governance Association, a representative body for school governors and trustees of state-funded schools in England.